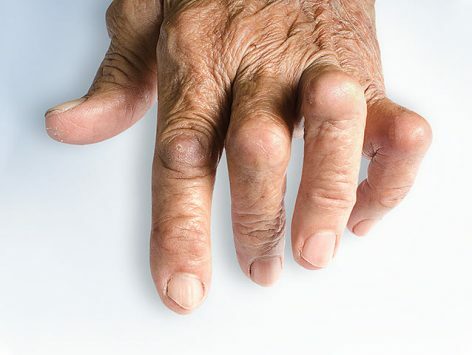 We will examine the pathophysiology of psoriatic arthritis, focusing on epidemiology, pathogenesis, and common presenting features of the disease. We’ll also review data reflecting the current diagnostic ability among rheumatology and dermatology providers. Support for this activity has been made possible through educational grants from Lilly, AbbVie, Celgene, and Janssen. This activity has been designed to meet the educational needs of nurses, nurse practitioners, and physician assistants. Other healthcare providers may also participate. 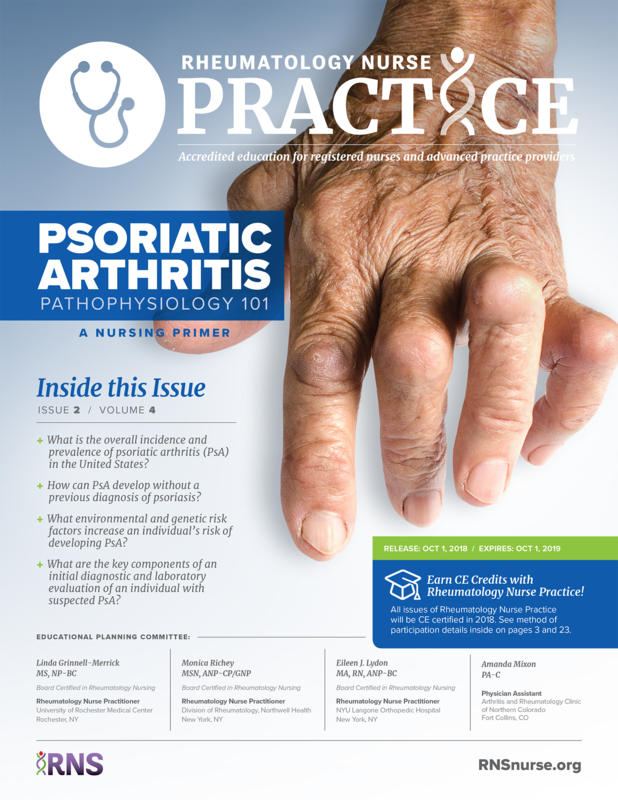 In this issue of Rheumatology Nurse Practice, we’ll examine the pathophysiology of psoriatic arthritis, focusing on epidemiology, pathogenesis, and common presenting features of the disease. We’ll also review data reflecting the current diagnostic ability among rheumatology and dermatology providers. Linda Grinnell-Merrick, MS, NP-BC, has disclosed the following relevant financial relationships specific to the subject matter of the content included in this educational activity: AbbVie, Celgene, Janssen, Novartis/SB; Lilly, Sanofi/C. Eileen Lydon, MA, RN, ANP-BC, has disclosed the following relevant financial relationships specific to the subject matter of the content included in this educational activity: Novartis, AbbVie/SB; Horizon, Sanofi/C. Monica Richey, MSN, ANP-CP/GNP, has disclosed that she does not have any relevant financial relationships specific to the subject matter of the content of the activity. Amanda Mixon, PA-C, has disclosed the following relevant financial relationships specific to the subject matter of the content included in this educational activity: AbbVie, Lilly/C,SB; Celgene, Novartis/SB; Pfizer, Regeneron/C. This newsletter was reviewed by Tiffany Clark, CNP. Ms. Clark has disclosed that she does not have any relevant financial relationships specific to the subject matter of the content of the activity. Alexandra Howson, MA, PhD, CHCP, Medical Writer, has disclosed that she does not have any relevant financial relationships specific to the subject matter of the content of the activity. There will be no discussion of investigational and/or off-label use of pharmaceutical products or devices within this activity. 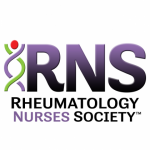 Rheumatology Nurses Society designates this educational activity for 3.1 contact hours (2.4 pharmacotherapeutic contact hours). There are no fees to participate in the activity. Participants must review the activity information, including the learning objectives and disclosure statements, as well as the content of the activity. To receive CNE credit for your participation, please go to rnsnurse.com/rnpce and complete the post-test (achieving a passing grade of 70% or greater) and program evaluation. Your certificate will be emailed to you upon completion. © 2018. This CNE-certified activity is held as copyrighted © by Rheumatology Nurses Society. Through this notice, the Rheumatology Nurses Society grants permission of its use for educational purposes only. These materials may not be used, in whole or in part, for any commercial purposes without prior permission in writing from the copyright owner(s).